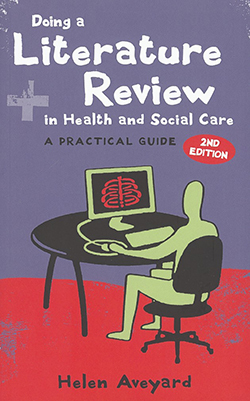 This book provides a concise and informative guide to the process of literature reviewing in nursing, health and social care, and is applicable to students and professionals. It is well-structured and easy to read, covering topics from 'what is a literature review?' to how to write and disseminate findings. Although there are many texts available to assist with writing a literature review, this one offers the additional elements of useful tips and practical guidance. The authors set realistic learning targets and activities in each chapter, accompanied by examples. References are relevant and up to date, providing suggestions for further reading. A vital skill for reviewing the literature is the ability to appraise the current evidence. An in-depth section on critiquing research is set out in the appendix, with suggestions for applying existing frameworks. This book acknowledges the different purposes for a literature review, whether it is for an academic piece, a project in the workplace or a paper for an academic journal. Its applicability to a wide audience is a strength.